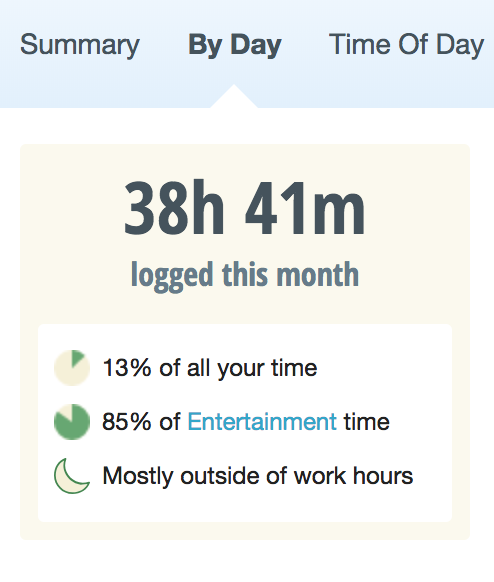 Work hours give you more context to your logged time. This feature allows you to see how your time at work differs from your personal time. Can I customize my work hours? By default, work hours are set to Monday-Friday, 8am-6pm. This is the best guess, and it's likely that your work hours are different. You can customize your work hours to suit your needs by going to Tools > Advanced Filters. You can customize your work hours however you like. That said, your work hours will probably be most useful if you set them to be as close as possible to your normal routine. What can I do with work hours? Charts: You will see indicators of your work hours on any chart that shows logged activities plotted on a timeline. For example, the 'By day' Reports for your productivity pulse for the current month will show grey indicators for your time outside of work hours. Dashboard: Your dashboard has a side by side breakdown of your work-hours vs your non-work-hours. Detail Reports: Within the detail reports for a specific activity, you will see whether most of the time was logged inside or outside work hours. This can be helpful when trying to understand the impact of an activity on your work time. Goals & Alerts: You can set goals for either your work hours, your non work hours, or your total logged time. This will help you focus your goal efforts on the times where they matter the most. Setting a goal for less than 1 hour of distracting activities during work hours leaves you free to catch up on social media as much as you like after hours.